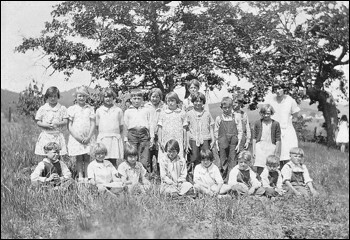 This is a 1930-31 class photo from Independence School in southern Oregon, grades 1-8. My mother Fredene Ama Daugherty is in the front row (fourth from right) and her teacher Frances (Fitzgerald) Weaver is in the back row (far right). Years later, at Roosevelt School in Medford, Frances was also my brother's first grade teacher as well as mine. Dear Little Fredene: I am sending the picture at last but it is poor. Wish they could all have been there when it was taken. How are you progressing in music, Fredene? I will send you the picture you want for your book later, Fredene.